Parsippany Dentist Offers FREE July Sensitivity Coaching! If there’s any perfect time to have a refreshing, sweet ice cream, it’s in the summer. President Ronald Reagan knew how the American people loved their ice cream—both for nutritional value and tastiness—so he declared July as National Ice Cream Month and the third Sunday of July as National Ice Cream Day. As the President said, he wishes for the American people to observe the holidays with “appropriate ceremonies and activities.” But what if you can’t even enjoy a simple ice cream cone anymore because of your sensitive teeth? 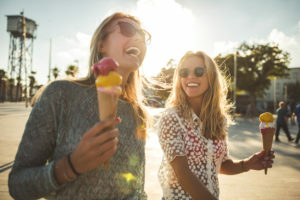 Your Parsippany dentist is here to help you strengthen the enamel on your teeth so you can celebrate National Ice Cream month with cold treats this summer! Tooth sensitivity occurs when you have weakened enamel on your teeth. The enamel is the substance that protects your teeth. Sometimes for several reasons—like bad oral hygiene or gum disease—your enamel can thin or the gums protecting your sensitive tooth roots will begin to recede. The insides of your teeth including the tooth root and sensitive nerves are supposed to be protected by a thick layer of enamel and healthy gums. Overtime, we all naturally wear down enamel, but we can preserve it with healthy dental hygiene and a healthy diet. You can work to save your enamel by avoiding acidic foods and drinks like sodas, high-sugar carbs, and sticky candies. Also, brushing your teeth gently, working to massage rather than scrub your teeth is more effective than abrasive brushing. One more way to preserve the strength of your teeth is to avoid bleaching them too often or without the help of one of our professionals. Speak with either of our doctors about how dental treatments may affect your smile before trying them. How can Rauchberg Dental Group help my tooth sensitivity? An in-depth evaluation of your oral health. An assessment of your current risk of tooth decay/gum disease. An inspection of your bite. A comprehensive look internally and externally with digital x-rays. A thorough discussion of the appointment and any recommendations for restorative treatments. Enjoy Your Sweet Treats This Summer! If you’d like to celebrate National Ice Cream Month with yummy frozen treats but have a hard time of getting past the tooth pain associated with hot or cold foods, you need to visit us. You should be able to enjoy a scoop of ice cream when you want to without cringing from dental pain. Contact us today to schedule your appointment. Comments Off on Parsippany Dentist Offers FREE July Sensitivity Coaching!